We assist Sri Lankan parents in completing their childs Birth Registration, Citizenship Registration with the Sri Lankan Authorities at the Consulate in Geneva. All required Forms are avaiilable. Also we can draft letters in English re ETA Visa, Sponsorship,Appeals, SL Banks, Lawyers etc. 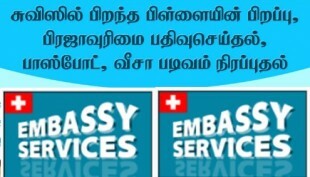 and even Swiss Doctors for Faxing your ailments described in Tamil duly translated. Advisory services are free.